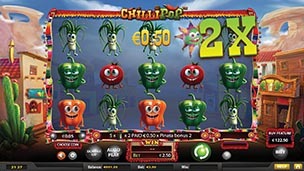 Spice things up with Chillipop, the cluster-based, cascading slot game with a secret ingredient: an expanding grid offering explosive new ways to win. From the Mariachi soundtrack to the potent red and green chilli symbols, Chillipop is suffused with the spirit and sizzle of Mexican cuisine. Players try to assemble the perfect salsa, matching symbols like tomatoes, onions, garlic, and red, yellow, and green peppers to create the tastiest (and top-paying) combinations. Like the sauce itself, things can heat up quickly in Chillipop; any configuration of 3 or more adjacent symbols pays out, and as items are added to the pot, new symbols cascade down to replace them. Couple this with the wild piñata symbol – which can substitute for any ingredient, as well as creating stacked multipliers when several appear on-screen – and players can create maximum flavour from a single spin. The fiesta gets into full swing with the Free Spins feature, triggered by 3 or more pack mule scatter symbols appearing at once. 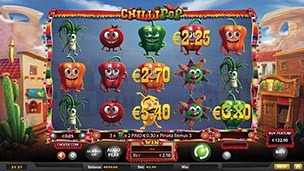 Over an allocation of between 5 and 26 free spins, Chillipop then uses Betsoft’s proprietary ‘trail system’ to track the number of sombrero-sporting mules that players collect, with set milestones expanding the size of the cooking pot even further. From an initial 5×3 grid, the Free Falls feature can grow the playing area to a massive 8×8, with the new dimensions dramatically increasing the number of paylines. A fiesta favourite, the stuffed piñata serves as the wild symbol, standing in for any other basic ingredient. The first piñata multiplies the payout of a winning cluster by 2x, with each additional wild cooking up a further +1 to the multiplier in an ongoing stack. The humble pack mule, carrying ingredients, triggers the exciting Free Spins feature when it appears in quantities of 3 or more. Up to 15 can appear at once, awarding a max of 26 free spins. 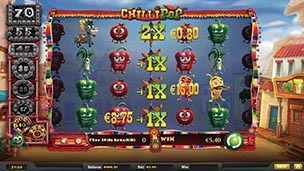 Players collect mules during free spins to expand their cooking pot, with milestones set at intervals between 5 and 70. You can also trigger Free Spins mode at any time with the Buy-In Feature.